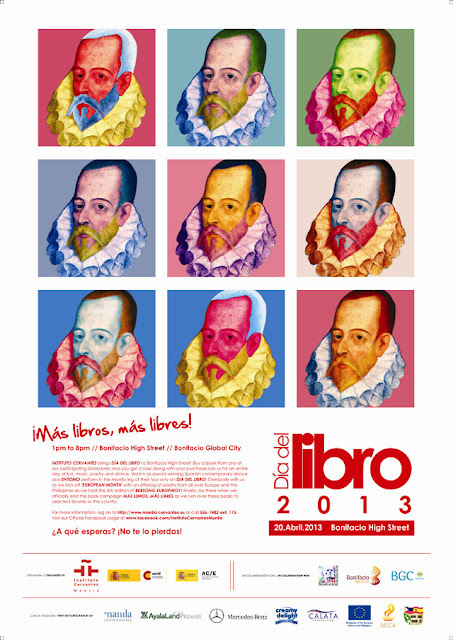 Instituto Cervantes de Manila celebrates Día Internacional del Libro (International Book Day) for the first time in Bonifacio High Street, Taguig City, on April 20, 2013 from 1-8pm. Día del Libro is being celebrated annually by Instituto Cervantes centers across the globe. It has its roots in the centuries-old Catalan tradition of exchanging books for roses. For every book purchased, each buyer will receive not only a 20-percent discount but a long-stemmed rose courtesy of participating bookstores. When you see a person is carrying a lot of roses, that means s/he bought a lot of books at the event. Aside from the book market, there will also be a poetry recital, music and a dance performance by a Spanish contemporary dance duo. Día del Libro was originally celebrated every third week of April to commemorate the death of two of Western literature’s most well-loved writers - William Shakespeare and Miguel de Cervantes, author of Don Quixote de la Mancha. Not only did these two die on the same year (1616), they also died on the same day - April 23rd. Participating bookstores include National Book Store, PowerBooks and Fully Booked, as well as specialized bookshops such as Ortigas Foundation, National Historical Commission of the Philippines and Solidaridad Bookshop, owned by National Artist F. Sionil José.